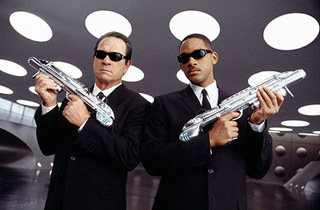 After five years of false starts and almost $100 million spent, with a sizable portion of this for bringing back Will Smith (seen recently in "Ali"), Tommy Lee Jones ("Space Cowboys"), and director Barry Sonnenfeld, you would think that they could come up with something more interesting for "Men in Black II", the sequel to the 1997 smash sci-fi comedy. 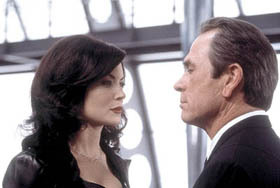 Unfortunately, other than the on-screen reunion of Agents J (Smith) and K (Jones), "Men in Black II" has little else going for it as its threadbare plot retreads material from the first film. Unfortunately, the story of "Men in Black II" quickly degenerates into a clothesline for one absurd gag after another, some of which are funny, but many of which are not. Among the film's better gags include an entire civilization confined to a locker in New York's Grand Central Station that worships K, a problem of scale when Serleena lands in Central Park, and a cheesy 1970s mockumentary hosted by Peter Graves that provides background on the 'Light of Zartha'. Unfortunately, a lot of the gags misfire or quickly wear out their welcome, particularly the ones that recycle humor from the first film, such as Smith's tiresome streetwise chatter, 'Frank' the talking dog (voiced once again by Tim Blaney), and the film's opening action sequence, where J takes on a giant worm in the New York subway. As far as laugh quotients go, Sonnenfeld's recently much-maligned "Big Trouble" was actually a funnier and more interesting film. The chemistry between Smith and Jones is the film's only asset, with Smith's easygoing style once again a good match for Jones no-nonsense straight-man approach. As the film's underwear model-impersonating villain, Boyle does a passable job, though she doesn't quite go over-the-top, which is something that a film like this needs. Much of the first film's cast also returns in this outing, including Rip Torn ("Freddy Got Fingered") as M.I.B. head honcho Z and Tony Shalhoub ("The Man Who Wasn't There") as the cross-eyed huckster Jeebs. New faces include Johnny Knoxville ("Coyote Ugly") as a 'so obvious it's a special effect' two-headed alien that helps Serleena with her nefarious plan, Patrick Warburton ("Big Trouble") as an M.I.B. reject, and Rosario Dawson ("Josie and the Pussycats") as a waitress whom J becomes enamoured with. When "Men in Black" first premiered in the summer of 1997, it was unpredictable, fresh, and even funny. Now, five years later, its successor is tired, mildly amusing, and with a running time under an hour-and-a-half, very short. But unlike the civilians in the film who unwittingly witness alien activity, moviegoers will not need to be neuralyzed after checking out "Men in Black II", as this is a summer blockbuster that ends up being completely forgettable.